We doubt the people behind Veganuary, Matthew Glover and Jane Land, the 'start the year vegan' , go vegan, be vegan , stay vegan campaign, could have dreamt of a better beginning to 2016. 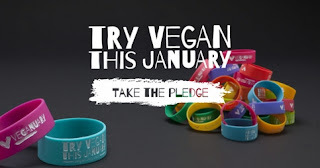 There has been unprecedented publicity for the vegan campaign that rides on a crest of a wave of New Years resolutions and fanatical January detoxing. Here's a round up of just some of the amazing Veganuary coverage so far. There's even a Veganuary Soundtrack as Hitthefloor.com have put together a collection of Vegan Veganuary Songs. Of course not all the PR has been favourable Harpers Bazaar managed to find a bizarre nutritionist to bizarrely agree to equate protein rich lentils with doughnuts, whilst Time Out magazine equally bizarrely equated Veganuary with eating vaginas....? More sensibly lots of new Vegan Society registered products are hitting the shop shelves too for veganuary. 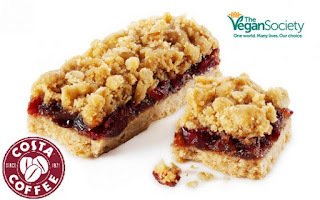 Joining Ikea's new Vegan Meatballs, the Vegan Quorn Chicken-less Pieces and the Pizza Express vegan Pizza is the Costa Coffee fruit slice.